In 1959 a great tragedy occurred not far from this site when the Susquehanna River broke through and entered the mine leased by the Knox Coal Company. The River Slope Mine was only five years old at the time of the accident, but it already extended well out under the Susquehanna River. The Knox Coal Company, and its lessor, the Pennsylvania Coal Company, had ignored map "Stop Lines" — where mining could not take place because of inadequate roof thickness — and continued to mine off course. State law prohibited mining within 35 feet of a riverbed, but the River Slope Mine came within 19 inches of the Susquehanna. Less than two feet of rock and gravel separated miners from 10 billion gallons of water. It was not enough. When the roof gave way, 74 men were trapped. 62 escaped while the remaining 12 were never found. The Susquehanna River had smashed into the mine, creating a whirlpool that pulled the water in and flooded miles of mines throughout the Wyoming Valley. 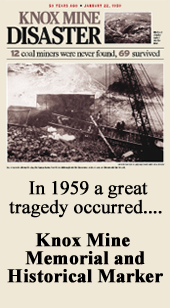 The disaster at Knox ended most deep mining in the Wyoming Valley. John's Grandfather John Baloga was one of the 12 miners who were never found. The Knox Mine Disaster Memorial and Pennsylvania Historical Marker are both located on the property of Baloga Funeral Home Inc.